Shaam Savera means Evening and Morning. 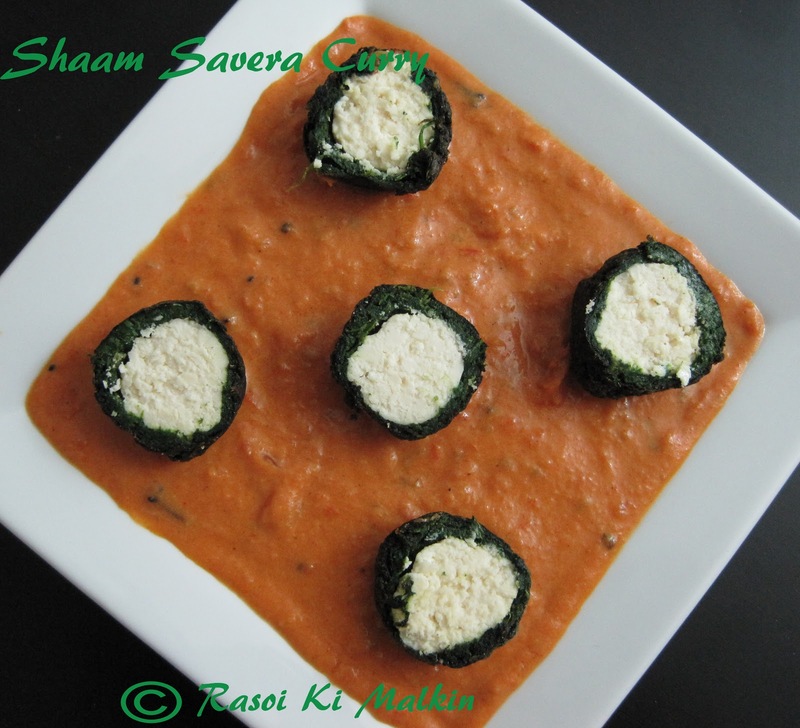 This is made with Spinach and grated Paneer. This is one of my favorite dishes as it is very tasty and nutritious. In the preparation you have to make the gravy and spinach koftas stuffed with Paneer and then you have to integrate them at last. Clean the spinach first. Take a pan and boil some water in it. Put the spinach in boiling water for 3 mins and immediately transfer them into the cold water. After 5 mins take extra water from spinach by squeezing it and chop the spinach. Now add some oil into a pan and add 1 tb spn of ginger garlic paste, chopped chillies, coriander powder, chopped spinach,salt and cook it for 5-10 mins until the moisture is gone. Let it cool and then add corn flour to it and make small balls. On the other side take grated Paneer and add little salt to it. Start making same number of balls as spinach. Now take spinach ball into your palm and flatten it. Stuff the Paneer ball in the middle of spinach and patch all the spinach corners close in the form of a ball. Complete making these balls and deep fry it oil and keep it aside. Take a pan, add some oil to it. Fry cloves and cardamom for 2 minutes. Add ginger garlic paste and fry it. Add pureed onion and cook until it turns brown color and then add tomato puree, chopped chillies, salt, garam masala powder and some water (3/4 cup), sugar and bring it to a boil. Once boiling, simmer it and add cream to it and switch off the stove in 2 mins. Serve the dish with the koftas halved and placing it on the gravy. This goes well both with rice and rotis. This is new to me..Would love to try it.. Awesome...looks like a napkin spread on the plate and cups are placed..
Omg, cant take my eyes from ur shaam savera,truly inviting..
Shaam savera curry,looks quite innovative and yummy,new recipe for me,simply love it. SPECTACULAR!! I often make it - a fav in our household- you have done it perfectly! the curry looks very beautiful and colourful! Wow that looks incredibly tasty! And a lovely presentation too! so new to me.. would definitely try ! Thank u all friends for the wonderful comments.